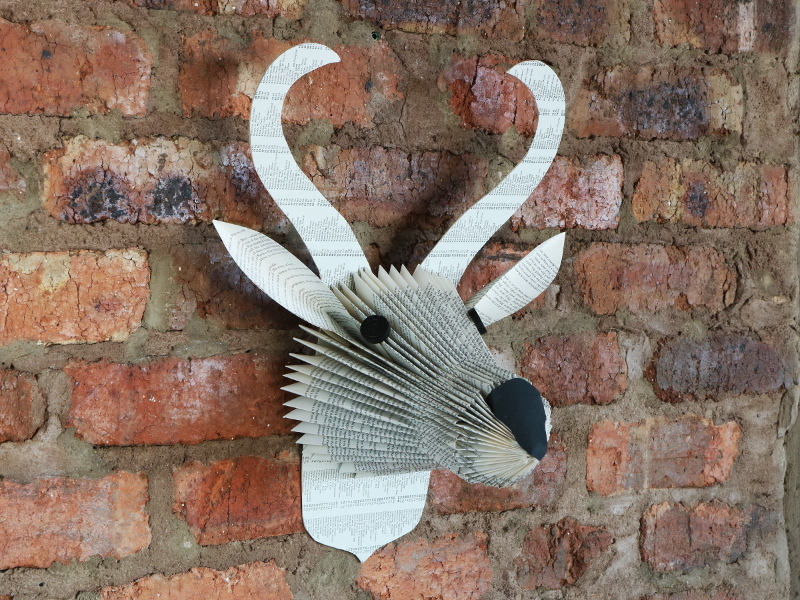 Recently we completed a commission to create a Folded Book Buck Trophy! You may have seen that years ago I had made a quick prototype. Consequently I found the prospect of fine-tuning the design quite exciting. We created a fair size herd.! As a result a Freshly Found Springbok trophy is now hanging in the Kloof SPCA bookshop! Others have been sold in some local Upper Highway stores. Woza Moya (Hillcrest Aids Centre) still has stock of them. The only animal trophies that should be mounted on walls – are fake ones! That is my firm belief! 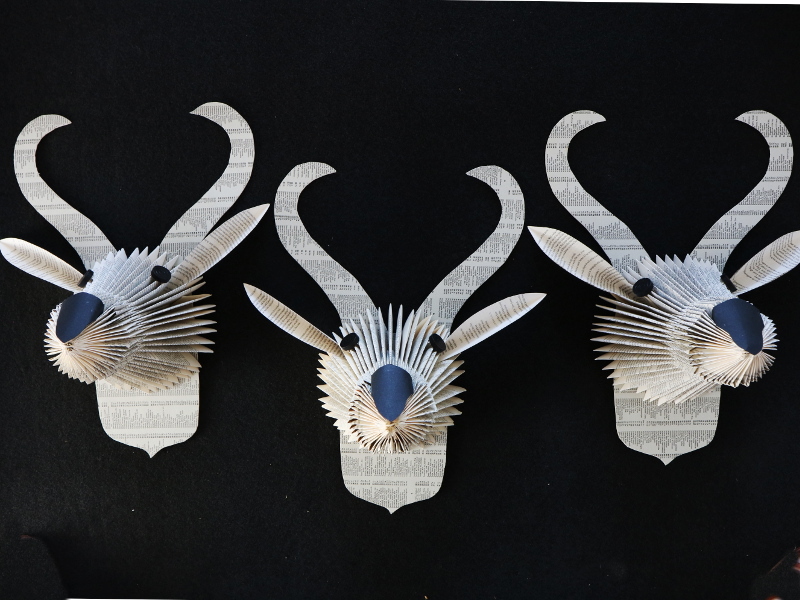 Consequently these ‘Book-bokkies” made from recycled books are a quirky and sensible substitute. In contrast, no live buck were hurt in this project! They are animal- and enviro-friendly. Fortunately I have been able to source second hand books from excess stock at local charity shops. Huge herds of Springbok roamed the arid regions of South Africa years ago. Sadly, their numbers have declined significantly. These days they are mostly found on some game reserves and farms. However, their beautiful silhoeutte, remains a familar and populare shape. We have reproduced their graceful lines and featured them on this mobile. A cluster of springbok cut from thin card, and suspended chandelier-like – both for an exhibition recently and as shop window decor too. We’ have walked a long journey folding books into various products over the years. 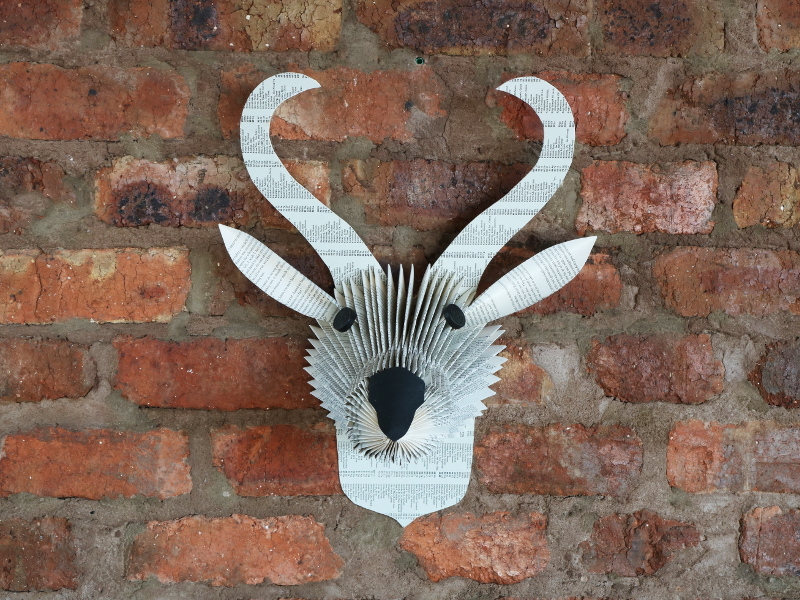 In fact, many of them – book proteas, light fittings, book vases and candle holders have had their season But these book bokkies are a delightful fresh product! Indeed, be on the look out for a Freshly Found Folded Book Buck on a wall near you! Contact us if you would like us to make a herd of Folded Book Buck trophies for you.